There are thousands of South African wine labels out there. It is very difficult for an estate to distinguish itself from all the competition in any meaningful way. Each estate obviously has its own story and quirks, but they all have that. Solms Delta is one of the few that differentiates itself very well, offering something truly unique. Not only is the wine unique, but the restaurant and the estate are also unique. Solms Delta has a rich history going back to the time when it was hunting grounds and seasonal grazing land for the San and Khoe people. The estate has embraced this rich heritage and done a substantial amount of excavation to reveal the legacy of these previous cultures. The tools and other archeological finds are housed in a museum on the estate and form part of a detailed explanation of the history of the estate and the people that used it or inhabited it over time. A second thing which makes Solms Delta unusual is that they have made the resident employees and their families join owners of the estate. This was evident to us in the level of interest the staff displayed and their genuine hospitality. Another aspect of the farm which is unique is the Dik Delta fynbos culinary gardens. It is a conservation intiative dedicated to propagating the rare and endangered plants and animals that sustained the first inhabitants of the Cape. The restaurant, Fyndraai, uses the produce of this garden in its menu. This is what makes the restaurant unique, it offers food which is truly local and authentic in a historical sense. I attended the opening of the Dik Delta culinary garden recently and enjoyed a lunch at Fyndraai restaurant. 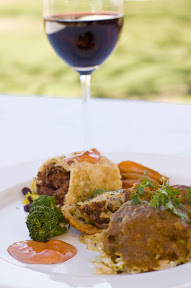 We were served the Heritage menu which is available to groups of 6 or more if you book in advance (R165 for 3 courses). I would actually highly recommend this menu, especially if you are entertaining overseas visitors. 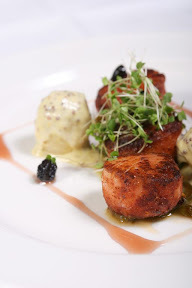 The menu consists of three courses of three dishes per course. I was stressing about what to order because I couldn’t bear to miss out on the other options, but I didn’t need to worry. This menu is served as small portions of all three dishes in each course so you get to taste everything. Each course has a dish which represents the three local cultures: Khoe, Malay and Afrikaans. But the dishes are modernised to guarantee a fantastic taste experience. For example, the Khoe main is veld vegetable and goats cheese bake. The Malay main is masala chicken curry and the Afrikaans dish is venison pie. They were all delicious, in fact, all nine dishes were delicious (yes, nine. 3 dishes x 3 courses, concentrate please!). I decided I needed to go back and try their normal menu as well. So a couple of weeks later I took them up on their invitation. We were a table of four and tasted quite a few of the dishes on the menu. For starters we tried the house salad (R39) which contained honeybush creamcheese and other interesting foliage. Pan fried scallops (R79) with ‘soetwortel’ puree and spicy avocado. We also had the veld vegetable and goats cheese bake (R40) mentioned above as well as a meaty option of lamb fillet and farmers sausage (R56). For mains we opted for the Karoo lamb loin stuffed with fynbos herb paste (R108), which was awesomely tender and tasty. The vegetarian risotto (R78) was light yet flavourful, just the way I like my risotto as they are often too rich for me. One person decided to have the curried snoek fishcakes (R42) starter as a main and the last dish we had was the blou wildebees loin (R108) with wild herb crust, excellently prepared. We thought we were too full for dessert but they sounded so interesting we just had to investigate them. We ordered three to share and they were mind blowing. We risked popping to lick the plates. Caramelised baked custard served with a koeksister and vanilla ice cream (R40). This sounds like creme brulee, but it’s way better. The Cape brandy pudding with ice cream (R42) was so light and delicate. The rooibos and coconut cheesecake with icecream (R41) was well received by the others but it was my least favourite because I’m not a fan of desiccated coconut. That brings us to the wine, although I should mention at this point that Solms Delta boasts a lovely picnic spot by the river and you can buy a picnic from them for R135 per person including some wine and water (from their own spring). Now to the wines. Solms Delta wines are unique because they use some desiccated grapes in the wines. These grapes have their stems crushed while still on the vine, then they are left to dry out a little. This concentrates the flavours. This is not the only unique aspect of the wines, they also have original and interesting names which refer to elements of life on the estate. We did a wine tasting and I was impressed with the wines. What was even more impressive was that the markup at the restaurant is negligible, they have added R15 onto the price of the wines regardless of the cost. Their flagship wine (Afrikana) is R189 in the restaurant, and some of them are as low as R70. Only their estate wines are available. They also serve water which is sourced and bottled on the farm. This review is already quite long, so I’m going to end there. I must just mention that the service was friendly and competent. I should also mention we dined al fresco and enjoyed the stunning views. When dining inside, you will be impressed with the glass floor which reveals the archeological excavations below. Basically when you visit Solms Delta you will be impressed.